Shopping for a new Hyundai Accent? The 2018 Accent Limited has the best safety equipment; other models will be outdated quickly as the government mandates automatic emergency braking. Sometimes a car is just a car. Not a rocket ship with rearview mirrors. Not an object of desire. Four wheels, four doors, one steering wheel and some seats. But the 2018 Hyundai Accent compact is better than that. 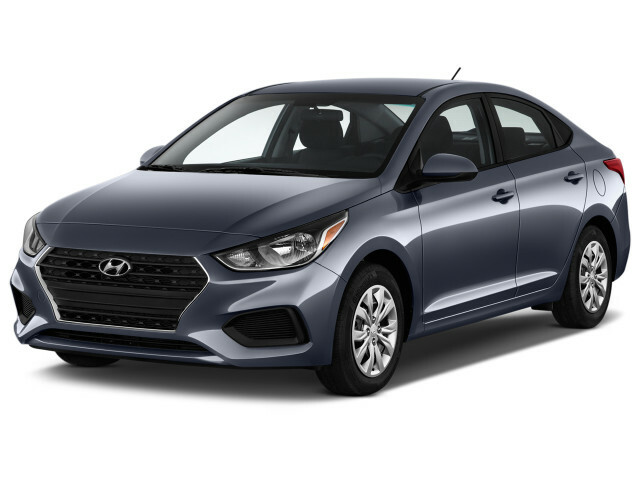 In SE, SEL, or Limited trim, the 2018 Hyundai Accent delivers the small-car virtues that first-time and budget buyers prize, and bundles them with an excellent warranty. 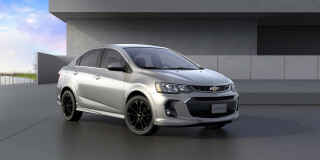 A 130-horsepower inline-4 grunts out enough power to scoot the 2,500-pound Accent in and out of traffic, the surface street kind or otherwise. Merges and stoplights can require a foot to the floor, and in that throttle position the Accent gets thrashy. Its 6-speed automatic shifts assertively only when it’s put into a Sport drive mode. Ride quality is somewhat absorbent on decent roads; speed bumps put the Accent into a more foul mood. The Accent can carry four adults, with front head and leg room put in priority position. The seats aren’t particularly supportive but the driving position is agreeable. Tall back-seat passengers will have to finagle their feet through small-ish doors, but their space is fine, too, and the Accent’s trunk has more cubic feet on tap than a Caddy ATS. Hyundai gives every Accent a rearview camera, but automatic emergency braking only comes on the Limited trim level. For our purposes that becomes the only model we’d recommend; it also comes with heated seats, 17-inch wheels, a sunroof, and a 7-inch touchscreen infotainment system with Apple CarPlay and Android Auto. The Accent skips navigation, leather, power seats, and other nice things, but for less than $20,000 it‘s good enough to steer some buyers clear of the used-car conundrum. The 2018 Accent tucks neatly–almost invisibly–into Hyundai’s sedan lineup. We like a smartly styled sedan, especially one that smartly apes a hatchback. The 2018 Hyundai Accent lets its roofline flow almost to the rear end, and that liberates interior space and avoids the small-car pitfalls of design, and they are numerous. The Accent bookends the Hyundai sedan lineup, wedges the bigger Elantra right up against the biggest Sonata (the Azera? Toast this year). It takes on so many lines from the other bigger Hyundai sedans, and we’re not mad about that at all. The grille, headlights, and running lights pucker at the front end in agreeable proportion. Mild flares draw some attention to the wheels, while its shoulder and roof lines give us a more long, drawn-out Accent than in the past. LED taillights on the Limited wouldn’t be out of place on either the Sonata or Elantra, because the shapes are so similar. What’s missing? The hatchback model. Hyundai thinks it can go it alone with just a four-door—and if we’re being honest, a lot of small crossovers yet to come. Also smart. Inside, the Accent matches the interiors of those other four-doors with good small-car grace. There’s not much room for some of the undulations or any spare dash real estate, really. What’s there is simply divided into pods for gauges, climate controls, and a touchscreen. Even though it’s mostly rendered in hard plastics, the Accent’s cabin bears the marks of good taste in color combinations, grains and textures. Base models get a smaller 5.0-inch color touchscreen, but we haven’t seen how it’s integrated. Our test driver had the larger 7.0-inch screen, which looks theater-sized in context. The numbers don’t tell the whole Hyundai Accent performance story. Performance is a hard hurdle for economy cars to clear. Their drivetrains and handling may be well sorted for their commuter duty. Against the vast spectrum of cars, they can’t help but fare worse. With a pointed drone under hard acceleration, and accompanying direct-injection clatter, the Accent’s powertrain talks about acceleration more than it commits the act. Its 1.6-liter inline-4 delivers 130 hp in all, and 119 lb-ft of torque. The saving grace? A curb weight of about 2,500 pounds in base trim, or roughly a 1990 Miata with two people and luggage. We wouldn’t promise the Accent could hit 60 mph in less than 10 seconds, but it wouldn’t surprise us. The only Accent we’ve sampled had a 6-speed automatic with a drive-mode button that slightly remapped its shift patterns out of the economy-car doldrums. That button relieves the indecision and putting-off programmed into the automatic’s default shift patterns. If there were a way to alter it permanently, we would. A 6-speed manual comes on base models only. A strut front and torsion-beam rear suspension tamp down most of the moderately rude roads the Accent encounters in daily driving. Base cars have rear drum brakes and 15-inch wheels, but discs appear on SEL models and 17-inch tires show up on the Limited, which we drove. In that configuration, ordinary speed bumps sent a jolt through the small car but settled quickly. 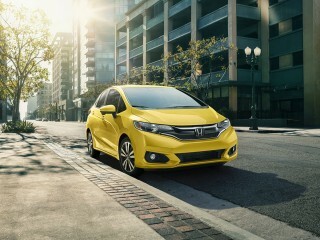 It’s more compliant than the Accents we’ve driven in the past, but we can’t vouch for the thin-skinned base cars, and still think the Honda Fit delivers the best ride in this niche. We’d lay some blame for the Accent’s wandery steering at its feet, too. Hyundai’s electric motor-driven steering doesn’t track very well on the highway or on crowned roads, and mileage-oriented treads are partly the reason. All this, and the 2018 Accent still comports itself with a nimble feel when it’s driven on two-lane roads at moderate speeds. It’s a commuter car, not anything that deserves a hyphenated name or aspires to it, even. It’s engineered to behave well on the kind of pavement you’d find inside a ring road, not outside it. A 2018 Hyundai Accent can carry four adults without apologies. Not every car chore calls for an SUV. The Hyundai Accent sedan does a fine job of transportation for up to four adults, and its cabin looks neither spare nor cheap. Five people won’t fit comfortably, despite the presence of a rear middle seatbelt, but the Accent has a big trunk for its size and good small-item storage. 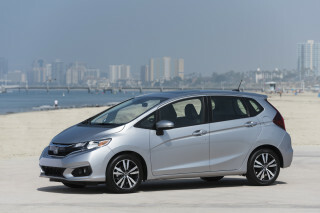 The latest Accent measures in at 172.6 inches long, and it rides on a 101.6-inch wheelbase. It’s small in footprint, but Hyundai extracts as much interior space for people as it can. The Accent surrounds front-seat passengers with elbow and knee room. Head room swells; there’s enough play in the height-adjustable chair for 6-footers to slide easily under the Limited’s sunroof, no need for a legs-out driving position. A telescoping wheel on SEL and Limited trims puts just about any driver into a good position at the controls. The seats don’t have much in the way of firm bolsters, and not nearly enough lumbar support. They wear a knit cloth upholstery that grips like a Target tablecloth, which is to say not much. Still, they’re comfortable for around-town trips where no one’s timing laps or max-lat figures. Between the driver and front passenger, a center console has a slide-top armrest. A rubber-lined smartphone bin sits just ahead of the shifter, near the USB port. The front doors have shallow bins for handles; they’re the perfect place for a credit card to sit while your tall mocha appears in the drive-thru window. The trunk in the Accent is large, not just for an economy car. It’s bigger than the bin in a Cadillac ATS or a Benz E-Coupe. The rear seats fold forward, and give the Accent the ability to bring home six-foot objects. With the trunk closed off, the rear seat can accept two tall passengers, or three children. The door cuts don’t make it easy for big feet to slide in, but head room for bigger people is fine. Interior fit and finish depends on your sentiments toward hard plastic. We haven’t seen many cars carry off this much of the stuff this well. The Accent’s cabin could double for that in an Elantra, if you didn’t tap on the dash and hear its hollowness. 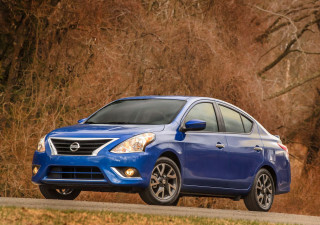 The Accent gets raspy under hard acceleration, too, but at its price, it’s pleasantly hushed. No crash-test data exists yet, and automatic emergency braking only comes on the 2018 Accent Limited. A new body structure should improve on the last Accent’s below-average scores, and this time, more standard safety equipment avoids some easy-to-spot pitfalls. A rearview camera is standard, and so is Bluetooth. However, Hyundai only offers automatic emergency braking on the most expensive Accent Limited. Other automakers, like Toyota, have gone the extra mile and have made that feature standard on every new model they build (though not on some carry-over cars). Blind-spot monitors and surround-view cameras? Not on this Accent, not yet anyway. It’s a good thing the light, airy roofline provides good outward vision. We’d only buy the 2018 Hyundai Accent Limited, because it’s the only place to get automatic emergency braking. The new Accent anchors Hyundai’s sedan lineup with a reasonably full set of features, some of which are absent in base models of its twin, the Kia Rio. The Accent doesn’t offer any options, though, just port-installed accessories. It lacks some features entirely, things like navigation and leather upholstery. On the upside, it has a good warranty (5 years/60,000 miles) and decent available infotainment. For $15,880, the 2018 Accent comes in SE, SEL, and Limited trim. All come with front-wheel drive and the 1.6-liter inline-4. An automatic transmission is a $1,000 option on the SE, standard otherwise. The Accent SE has standard 15-inch wheels, cloth upholstery, a rearview camera, keyless entry, power windows/locks/mirrors, a height-adjustable driver seat, split-fold rear seatbacks, tilt steering, Bluetooth, USB ports, steering-wheel audio and phone controls, a 5.0-inch color touchscreen and AM/FM/CD audio with four speakers, and air conditioning and cruise control. On the $18,180 Accent SEL, Hyundai adds automatic headlights, telescoping steering, a 7.0-inch touchscreen, satellite radio, Android Auto and Apple CarPlay (with no charge for access, unlike, say, BMW), and two more speakers. With the $19,780 Limited Accent, Hyundai pads on 17-inch wheels, automatic emergency braking, LED taillights, a sunroof, keyless ignition, front seat heaters that come on strong enough to have their own Tinder profile, and a handsfree trunk opener. The 2018 Hyundai Accent’s fuel economy is good, but could be better. 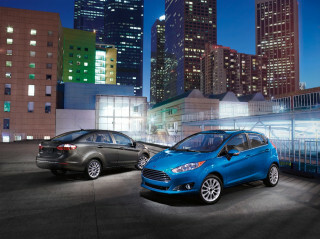 Small cars get big fuel-economy ratings, as a general rule. The 2018 Hyundai Accent falls into lockstep, with EPA numbers slightly higher than the very similar 2018 Kia Rio. With the manual transmission, the Hyundai Accent earns EPA ratings of 28 mpg city, 37 highway, 31 combined. The Rio’s 1 mpg down on the city and highway numbers when it’s equipped with the manual. 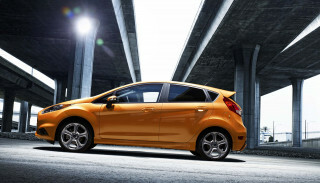 The automatic Accent gets 28/38/32 mpg, with the Rio trailing by 1 mpg highway. The differences come down to transmission and tire tune, and don’t represent any significant mechanical difference. 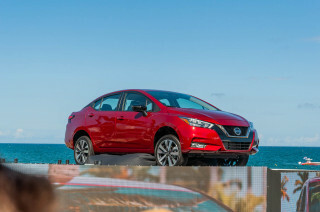 Compare those figures to vehicles like the 36-mpg-combined Honda Fit, and the 34-mpg-combined Nissan Versa, and the Accent shows room for improvement. Writer likes to make snide remarks and his feature approvals always include a 'but'. Its is the most handsome of all its competitors. Same for the design of the interior. 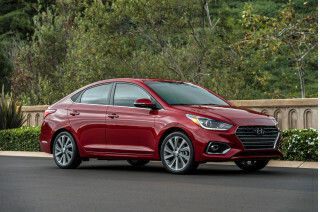 Looking for a different year of the Hyundai Accent?